Raman microspectroscopy, both linear and non-linear, is now extensively used as a unique and powerful method for studying heterogeneous molecular systems in situ or in vivo. Sub-micrometer spatial resolution is readily achievable with a con-focal microscopic configuration. On the other hand, infrared microspectroscopy does not compare with Raman, because of its low spatial resolution (5—10 μm) due to the diffraction limit. We have developed a new vibrational microspectroscopic method equivalent to infrared, using hyper-Raman (HR) scattering. HR scattering has its own selection rules that are different either from infrared absorption or Raman scattering. Infrared active vibrations are all HR active and Infrared/Raman inactive vibration can be HR active. Figure 1 shows a HR image of a β-carotene micro-crystal obtained with the infrared active but Raman-inactive C=C stretch band at 1564 cm-1. 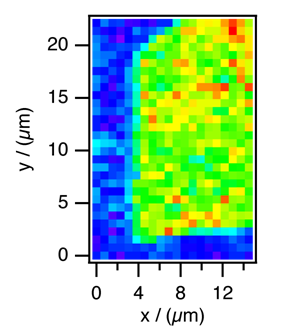 The exciting laser wavelength is 800 nm and the estimated lateral and depth resolutions are 0.6 μm and 1.4 μm. We are now able to observe infrared-active vibrations under a microscope by using HR scattering, while keeping the high spatial resolution characteristic of visible laser microspectroscopy. Fig. 1 Hyper-Raman image of a microcrystal of β-carotene. We have previously shown that p-nitroaniline (pNA) in CH3CN/CCl4 forms two distinct salvation structures, 1:1 and 1:2 forms, with one and two CH3CN attached to pNA. Infrared electroabsorption spectroscopy detects absorption changes due to the orientational and electronic polarizations of molecules under an applied electric field. The former gives quantitative information on the dipole moment, while the latter on the molecular polarizability. These two signals can be separated by measuring the χdependence of the signal, where χ is the angle between the external electric field and the incident infrared light field. The observed χdependence of pNA in CH3CN/CCl4 is shown in Fig. 2. From the singular value decomposition analysis of this result combined with an ab initio MO calculation (HF/6-31+G** level), the structure and dipole moments of the two forms has been determined as shown in Fig. 3. Fig. 2 The observed χdependence of infrared electroabsorption of pNA in CH3CN/CCl4 mixed solvent. Fig. 3 The structure of the 1:1 form (a) and that of 1:2 form (b).